"Great experience! Cheapest buy on the net! Thanks for everything and looking forward to watching "Nooma: Rich" when it gets in." The eighth and final chapter of the Love Comes Softly film series. The story continues with Belinda (Sarah Jones), a rare female doctor working in a quaint Missouri town. When her longtime friend and colleague, Annie (Haylie Duff), arrives so that Belinda can watch over her in the last stages of her pregnancy, Annie brings along her mother-in-law, Mary (Patty Duke), a seen-it-all nursemaid whose homeopathic remedies and folksy wisdom are at odds with Belinda’s scientific knowledge. As Belinda deals with the headaches Mary is causing, she must also address issues at home. While her adopted daughter discovers the joys and pains of a first love, Belinda and her husband (Jordan Bridges) find their own relationship is suffering over Belinda’s inability to get pregnant. Just as the town learned to put its faith in Belinda as their doctor, so too must Belinda learn to accept that the best guidance for her own problems may come from unlikely sources. Get the novel version of Love Finds a Home while supplies last. Check out the Love Comes Softly Complete Set- all 10 DVDs! 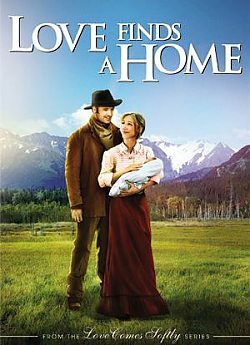 Enjoy Janette Oke's saga of the Davis family as they find love and build strong families on the American Prairies. Their past was dark... but in this town, they found the light. Sometimes you don't know what's missing until you find it. EXCELLENT movie for everyone to enjoy! Another Michael Landon Jr. movie well done!